This week is a very good time to stock up on PopCap titles. As is his wont, Major Nelson rolled out an announcement this morning detailing the various price reductions to be found on the Xbox Live Marketplace from now until June 24. He does this kind of thing almost every week, but it's not often that the sales are so enticing. The prime reason for this? A huge number of PopCap's hyper-addictive games have had their price tags slashed in half. 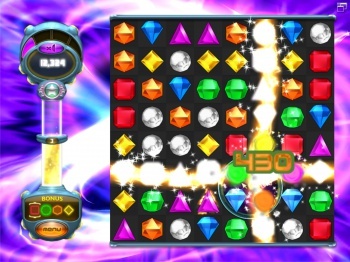 Full details can be found on Major Nelson's blog, but the quick and dirty version is that Bejeweled 2, Bejeweled Blitz Live, and Zuma can be yours for a mere $2.50 each. Zuma's Revenge and Bejewled 3 are a bit more pricey, but can be had for $5 and $7.50, respectively. All of these prices are half of what these titles usually demand, and as with all of PopCap's games, each of the aforementioned titles is incredibly, intensely addictive. They seem simple enough, but that's just the developer luring you in with a false sense of security before sinking its nefarious hooks into your dopamine receptors. We're big PopCap fans, is what I'm trying to say here. There are a number of other helpful additions to the Xbox Live Marketplace listed in Major Nelson's blog entry, including price cuts for hits like Limbo, Spelunky and Sine Mora. Also, there's apparently a semi-mysterious "Sega Publisher Sale" taking place for the next week that supposedly marks down Sega titles by up to 75 percent. Point being: If you haven't already rushed off to your Xbox 360 to snag a bunch of PopCap's games, you should click the hypertext link below to view the full list of promotional offers.